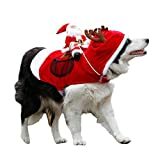 This Christmas, magical flying reindeer are not a requirement for Santa to fly to your home and deliver presents to your kids, because the family dog can pull him around just the same with this cool new Santa Riding a Dog Costume. 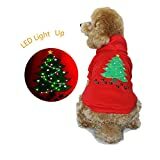 This fun and festive pet costume transforms your dog into Santa Claus' personal reindeer chauffeur with a saddle for him to ride on, a hoodie with reindeer antlers, and dual side pockets to deliver small gifts to everyone who hasn't been naughty this year. Hmm, this would be perfect if it included a magic Whiskey Barrel on the collar for the parents.